Sago or sagu palm, which falls under Metroxylon species, can be found scattered among Sabah and Sarawak swamp. Sago palm can be processed to produce sago flour, which used to be Melanau ethnic staple food. Sago flour is commercially used as food starch and biscuit (tebaloi).Worms (ulat mulong) that infested sago dead trunk is their main source of protein. 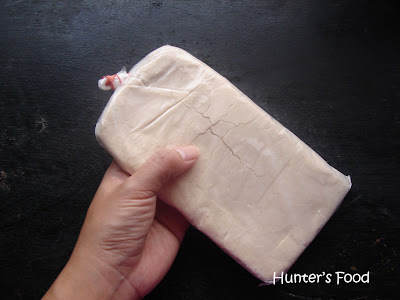 Sago flour is normally eaten in the form of Sagu linut, a glue-like sago flour added with hot water. However, one of my favourite past time is my mother's fried sago flour. I am keeping this last packet until the day I couldn't ignore my craving. Saving the best for last! Ney gambar experiment u ney? hehe. My mom also know how to fry sago flour, sampai ala2 crispy and kering2 sikit. me... selalu tak jadi, otherwise not as nyaman as when my mom do it. looks like this skill will probably go down with the elder generation.